This social studies program will involve your students in a variety of high-interest activities that supplement any textbook in grades 7-12. Lessons on Latin America motivates students to learn about the geography, culture, and history of this region. A typical lesson covers a curriculum topic during an activity for individuals, small groups, or the entire class. Most lessons can be completed using information on the student activity sheets. Lessons on Latin America has activities that students love to do. Each of the 75 lessons in this series usually has three or four activity sheets on reproducible blackline masters. Make as many copies as you need for your students. Most lessons are done in one or two class periods. 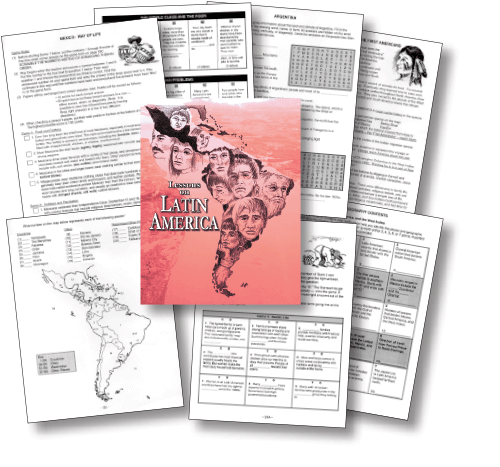 Lessons on Latin America has five reproducible booklets, each with fifteen lessons. You no longer need to prepare your own daily activities. There is always a special lesson ready for the next class period. Teacher instructions, lesson quizzes, and answer keys are included. The quizzes give you a fast and easy way to measure student progress, and can also be used as review sheets or homework assignments. Each booklet has about 50-60 masters. The complete set has 256 masters. This five-part program can also be ordered on CD in PDF format.